Hi, everyone! This is Yuanyu Zhang from the Large-Scale Systems Management Laboratory. It is a great opportunity for me to share my research with you. Broadly speaking, my research focuses on the security of Internet of Things (IoT) systems, with special interests in securing IoT wireless communications based on physical layer security (PLS) technology and designing access control schemes based on the emerging blockchain technology. Now, I am going to briefly introduce my research from these two aspects. When it comes to the IoT, I believe anyone can give an concrete application, such as smart home, e-health, intelligent transportation, etc. In these applications, a huge number of smart devices, like sensors, actuators, tablets, will be connected into the Internet via a variety of wireless communication technologies, like WiFi, Zigbee and Bluetooth. As we all know, wireless medium is open such that anyone close to a transmitter can receive its signals. Suppose the information conveyed by the signal is not encrypted, so what would happen if the signal is received by an eavesdropper? Obviously, the information is in danger! In IoT applications, these information may be your health data perceived by sensors around you and your financial transfer records sent from smart phones. Once these information are leaked to eavesdroppers, your life and property will be in danger. Of course, we can encrypt these information using secret key-based cryptographic approaches like what we do in wired communications. However, managing and distributing secret keys in wireless environment is challenging, especially for large-scale IoT systems. Besides, the cryptographic approaches usually require high computing power, which is unavailable for most resource-constrained IoT devices. This motivates the advent of the so-called physical layer security (PLS) technology, which uses the inherent randomness of wireless channels (e.g., fading, noise, interference) instead of costly cryptographic approaches to ensure no information leaked to eavesdroppers. As long as we can guarantee that the received signal of the eavesdropper is an degraded version of that of the intended receiver, the eavesdropper can abstract nothing from the signal. This conclusion has been proved from the perspective of information theory. The figures below shows the basic differences between cryptographic approaches and PLS technology. What my research does is to apply commonly-used PLS techniques in IoT systems and theoretically evaluate the security performances of these systems using some mathematical tools, like Probability Theory, Markov Chain Theory, Queuing Theory and Stochastic Geometry. Well, okay, I know it’s boring, but trust me, it is vitally important for understanding the PLS performance limits of IoT systems and contributing to the successful application of PLS techniques in these systems. If it does not sound boring to you, I would be very glad to share this research with you in greater details. Okay, ready for another research? You know what, this research may be more interesting, at least for me. The previous research focuses on the security of the information during its transmission, while this research focuses on the security of the information when it is stored somewhere as resource and accessed by some users or devices. Of course, resources are not limited to information, but also include actuators that may perform some critical tasks, like brake control and drug delivery. But one common thing is that, once these resources are accessed by malicious users, your life and property will be in danger. 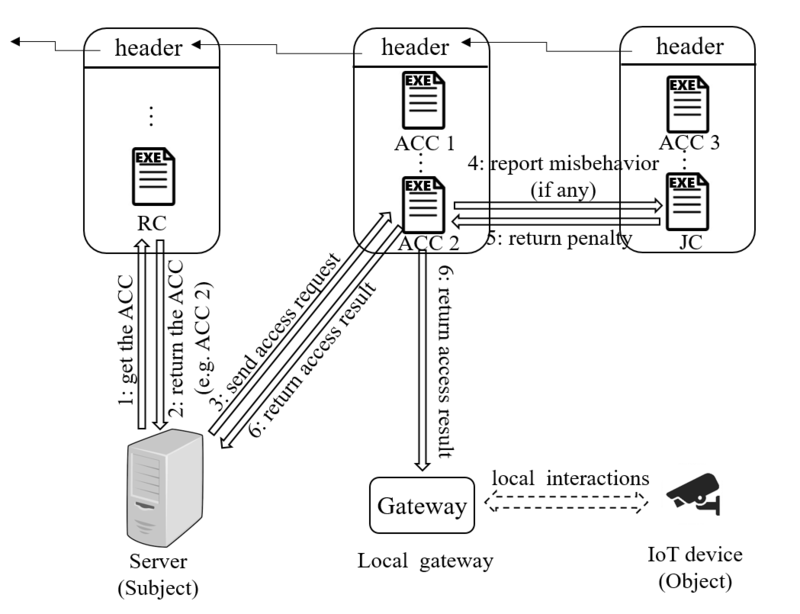 This research aims to design effective access control schemes to prevent illegal access to IoT resources. Traditional access control schemes are centralized, which means that they use a central server to control all access requests in the system. So what if this server is destroyed in disasters, or what if this server is compromised by some malicious guy? Yes, the whole access control scheme collapses. Now, question is how to tackle these challenging issues. Fortunately, the emerging blockchain technology provides us with a promising solution, because it is highly distributed and ensures reliable financial transactions among trustless peers all over the world. In this research, I use the Ethereum blockchain, which evolves into a distributed and reliable computing platform thanks to the introduction of smart contract. A smart contract can be thought of as a piece of code that is stored on the blockchain and distributed to all nodes in the system. 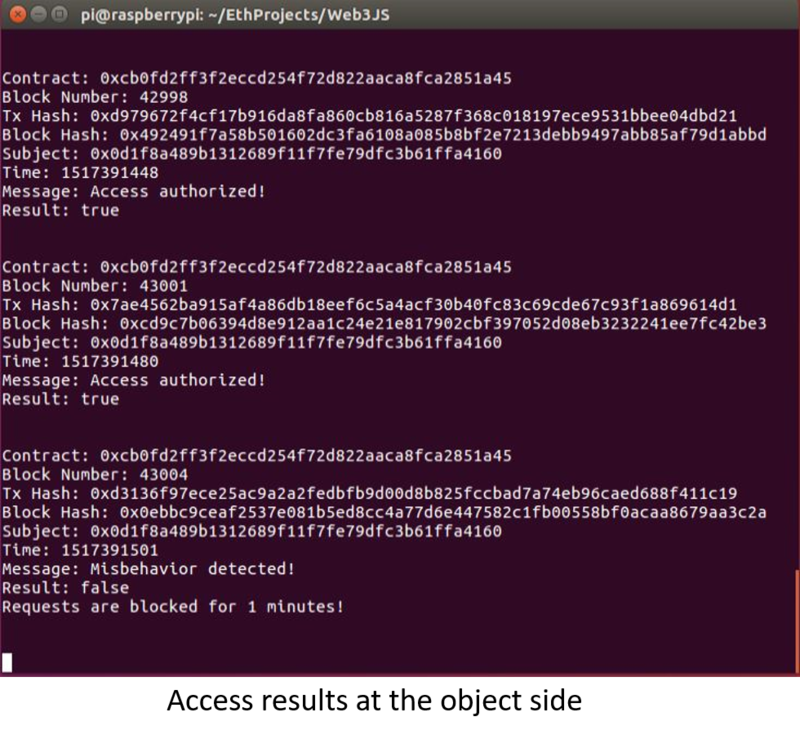 All nodes can execute this code and verify the correctness of the results. This ensures the correct execution of the smart contract as long as no one possesses more than 51% of the system computing power. 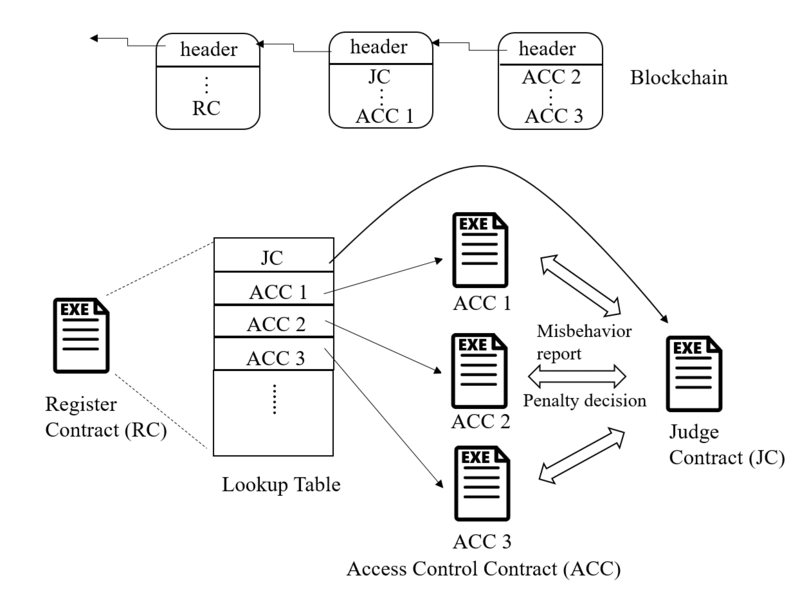 The basic idea of this research is to ensure distributed and reliable access control by expressing the access control policies and logic as smart contracts. 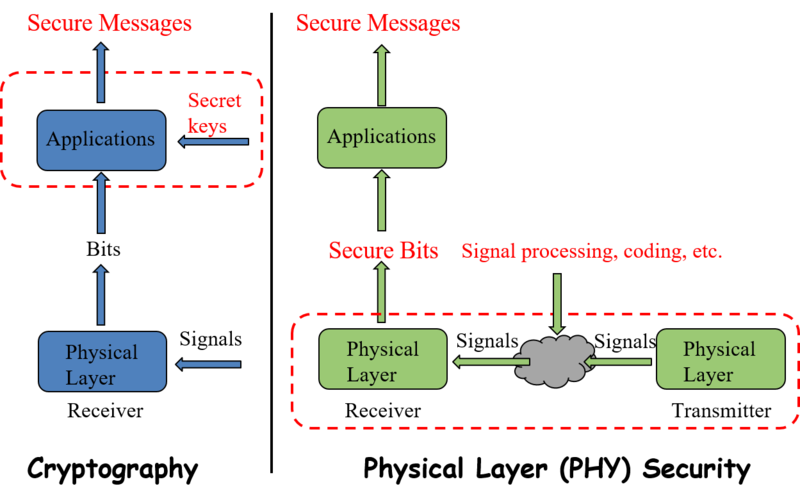 The access control framework is illustrated in the figure below. This framework consists of multiple access control contracts (ACCs), one judge contract (JC) and one register contract (RC). Each ACC is responsible for the access control of a subject-object pair, and implements both static access right validation based on predefined policies and dynamic access right validation by checking the behavior of the subject. Here, a subject is the node accessing the resources possessed by an object. The JC implements the misbehavior-judging method to facilitate the dynamic validation of the ACCs by receiving misbehavior reports from the ACCs, judging the misbehavior and returning the corresponding penalty. The RC registers the information of ACCs and JC, and also provides functions (e.g., register, update and delete) to manage these methods. 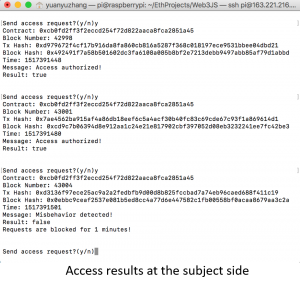 Suppose a server wants to access the resource of a camera in a smart home. The workflow of the access control is shown in the figure below. Step 1: The server calls the RC to retrieve the ACC (e.g., the ACC 2) for access control. 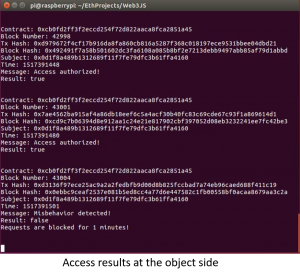 Step 2: The RC returns the address and ABI (similar to API) of the ACC to the server. 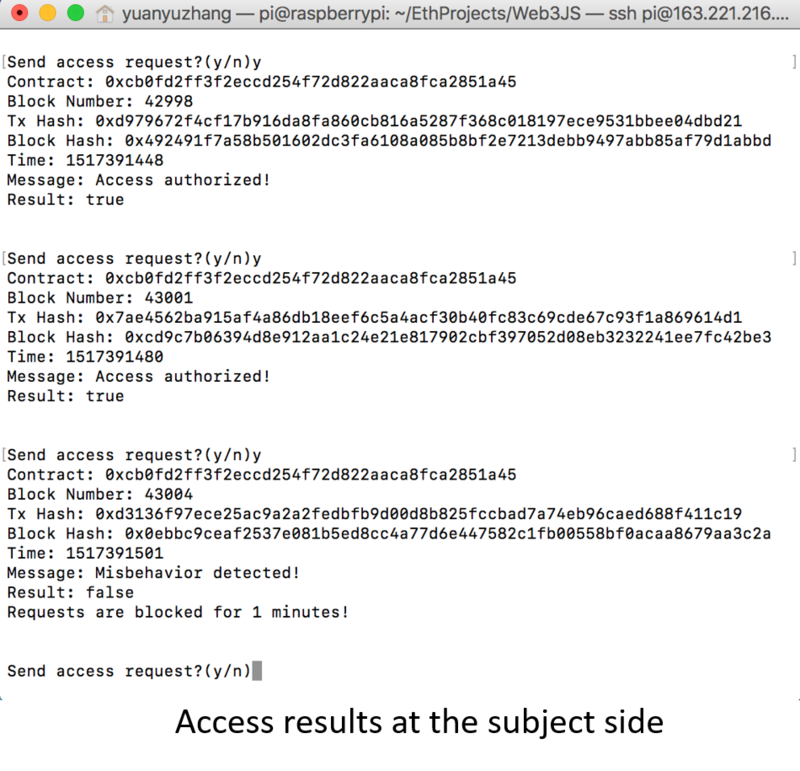 Step 3: The server sends a transaction to the ACC, which contains the required information for access control. This transaction will be encapsulated in a new block and the ACC will not be executed until the new block is mined and included in the blockchain by some miner. Step 4: During the access control process, the ACC will send a message to call the JC, if some potential misbehavior of the subject is detected. Step 5: Once the JC judges the misbehavior and determines the penalty, it will return the penalty to the ACC. Step 6: Finally, the access result will be returned to both the subject and object, after the access control process finishes. To demonstrate the feasibility of the framework, we provide a case study in an IoT system with one desktop computer, one laptop and two Raspberry Pi single-board computers, as shown in the figure below. And the results of access control at both the subject and object sides are illustrated in the figures below. Hello, world. This is from Assistant Professor Renyuan Zhang with Computing Architecture Lab. to share some progresses from our group, which are all about speeding up the machine learnings through efforts of advanced VLSI circuits. Why do we implement the machine learning in silicon? The artificial intelligence plays very important roles in the modern/post IoT. A common challenge is how to efficiently implement machine learning algorithms in systems with the cloud-edge prototype. Along with the development of computing processors, one option is to distribute the machine learning at the “edge” of systems as show in the sided figure. 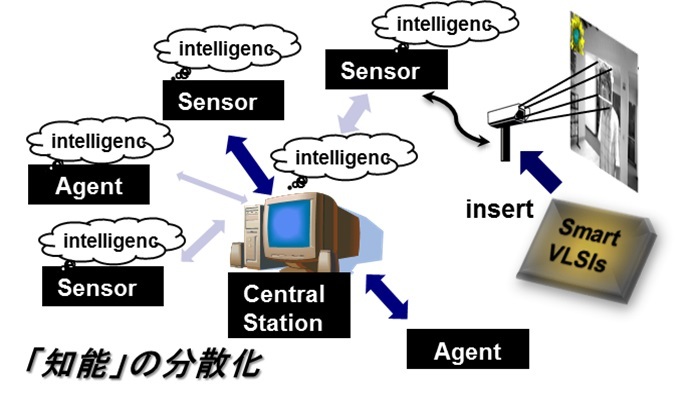 In such a system, both of learning and recognition (for instance) are carried out at the edge instead of central stations, which is helpful to reduce the communications and able to active movable equipment off-connecting any PC (such as vehicles and body-area). Unfortunately, very few on-chip learning processors have been developed for machine learning at edge in silicon. Both of digital and analog efforts have been done a lot to develop on-chip learning processors. Multi-computational-core is a general digital strategy to process a large number of complex computations in parallel (see machine learning works by GPGPU). Our group members also hold some experiences of implementing machine learning by CGRAs with very high parallelism. For many IoT tasks, the computational accuracy is not extremely required. Therefore, some approximate computing processors were designed by analog circuits. In some of my early works, it is found the chaos of analog signals greatly speeds up the learning process. We have realized ultra-high speed on-chip learning for some specific algorithms such as SVM or K-means. In summary, the CPU or GPGPU is not always applicable for every edge device; analog processors have potentials of high-speed and low-power, but their functions (target algorithms) are always fixed and specific. 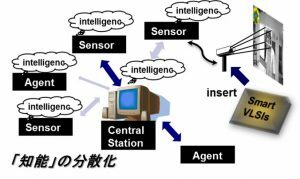 Therefore, most of current/previous IoT works, which employ machine learning, have to carry out the “learning” centrally, then do the recognitions locally. On the academia side, the ML and AI research/development is one of the most popular fields. There are many groups and societies are trying to design specific VLSI systems for realizing efficient ML. Most of those works are based on the high performance digital processors. The analog (even physics device) circuit has been a new (or we can say re-born) trend leading to ultra-high speed and efficiency. Our early work was one of world-first pure-analog ML chips with benefits but suffered from poor generalization. Thus, we are going to develop generally and practically feasible technologies in this field. In industry, many software/hardware makers start their competitions on VLSI chips for ML/AI in past five years (see “IBM Scientists Show Blueprints for Brain-like Computing,” “Building a Brain on a Silicon Chip” and “Intel Reveals Neuromorphic Chip Design”). The mobile supplier HUAWEI even actually applied the NPU (Neural Processing Unit) in their newest mobile chip “Kirin970”. 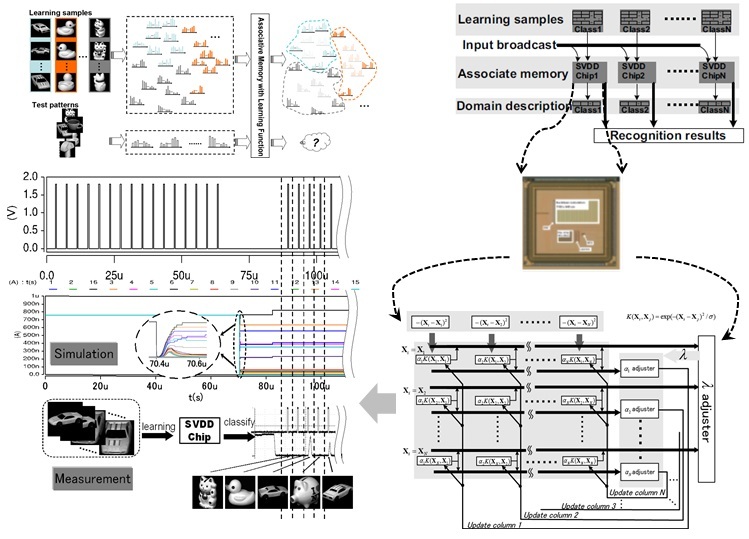 In our early works, world fastest learning (64-D SVM learning within 0.1us, 2012; 64-D K-means within 20ns, 2013; 64-D SVDD within 40ns, 2014) has been achieved (see the sided figure as an example: SVDD algorithm is implemented by VLSI to do the multi-class image classification). However, the algorithms and capacities were fixed. We expect to keep the speed benefit and generalize the target algorithms. As an exploration, we are expecting to develop general purpose on-chip learning processor which accelerates various machine learning processes by analog VLSIs. 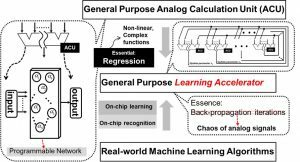 As consequence, local/on-chip machine learning is feasible and practical for ubiquitous applications. We are designing ultra-high speed and low-energy hardware (VLSIs) for implementing the so-called on-chip learning (not for specific but various algorithms). The analog approximate computing strategy is adapted. The circuit-, unit-, and architecture-level are explored; several actual VLSI chips are expected to fabricate as demonstrations. For instance, we will demo the visual tracking with ML by a single VLSI chip without any PC. As shown in the sided figure, three key ideas are included in this project: 1. General purpose Analog Calculation Unit (called ACU); 2. Fully-parallel accelerating strategy; 3. Expanding the learning capacity. It is a cross-field among high-performance-computing, the VLSI designs and machine learning theories. Firstly, we expect our novel learning mode: chaos of continuous signals, to impact the machine learning societies for reasonable applications. Along with the development of IoT, various demands of on-chip machine learning require the well-performance hardware besides CPU or GPGPU. Secondly, a general purpose ML accelerator leads to practical “smart chips”, which are embedded into the edge-devices of IoT. Currently, most of IoT works execute the recognition at the edge, but do the learning process on cloud or central stations. The edge learning offers a potential for industry to build more efficient and intelligent network, in which the machine learning can be done by VLSI chips instead of CPUs. Most importantly, the road-map of VLSI scaling-down might reach the end soon. Different strategies of high performance computing architecture should be explored. 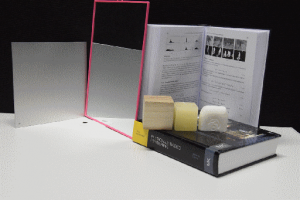 The progress of this project is expected to push the analog approximate computing fashion into practical fields. The developed ACUs can be applied in various architectures even together with digital frameworks. The general purpose and programmable analog computing, as an internal progress, offers a different option of data processing: lighter, but faster. Thank you very much for your kind reading.